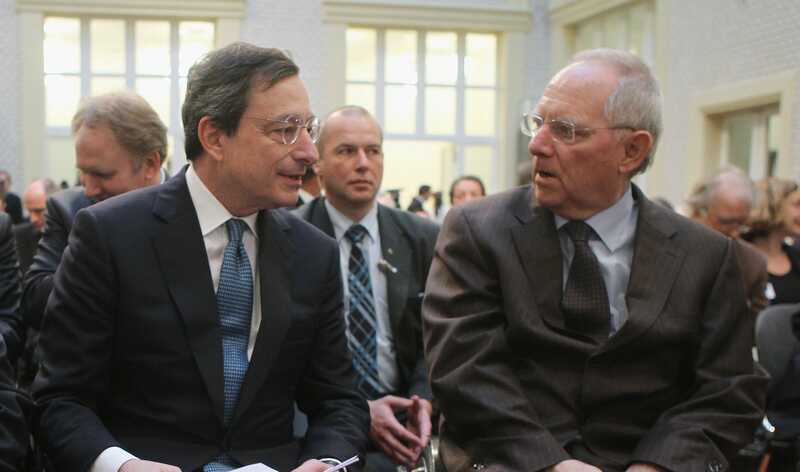 Getty ImagesECB President Mario Draghi (R) with German Finance Minister Wolfgang Schäuble. Wolfgang Schäuble, Germany’s finance minister, has reportedly said that the European Central Bank’s low interest rates will allow the country to balance its budget beyond 2015. The news will dash hopes of any possible deficit-funded stimulus from the country to boost ailing eurozone economies. Schäuble’s intervention came during ECB President Mario Draghi’s press conference, during which he is seeking to convince markets that the region will be able to pull itself out of its current slump. His work will have been made all the harder by the finance minister effectively taking the prospect of the German government significantly increasing its spending off the table. The news can be seen as a particular blow to Draghi who has recently called for Europe’s stronger economies to “exploit the available fiscal space” within the European Union’s rules to help boost flagging demand that has seen the region flirt with falling into deflation in recent months. Eurozone rules under the Fiscal Compact allow for member states to run a budget deficit of 3%, with Germany currently running a modest budget surplus. However, Schäuble has instead repeatedly stressed the need for fiscal discipline in the eurozone and today’s statement illustrates that his position seems as firm as ever.